Make spreading awareness of childhood apraxia of speech easy with these printable letters, brochures, cards, and more! Here you will find new and updated resources that make understanding apraxia easier for anyone who receives them – including teachers, grandparents, extended family, friends, and other community members! Want to receive our printed brochures by mail? New and free apraxia print materials are available here! Explains childhood apraxia of speech in easy to understand language for new teachers in a child’s life. Gives a list of suggestions and aid to teachers. This is a one page Word document that can be “personalized” to every child. Created by Diane James and used with her permission. What would children with apraxia of speech tell us — if they only could? This is an awareness building information flyer to help put perspective on the struggles and thoughts of children with apraxia. 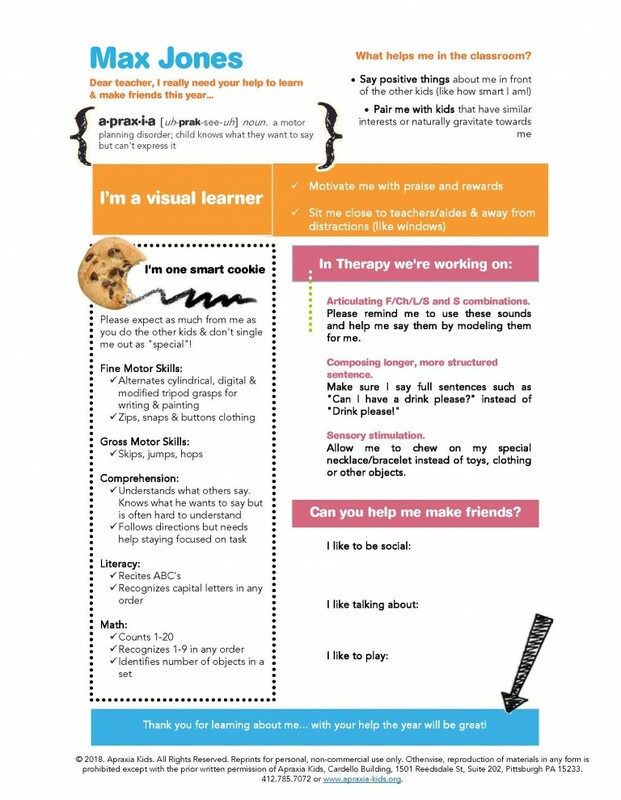 This is an easy to read brochure, explaining apraxia of speech in simple terms for the lay reader. This can be a great brochure to give parents, extended family, neighbors, friends and community members. This handout identifies questions and issues for parents to consider when locating a SLP for their child and also has suggestions on where to locate experienced SLPs. Spread awareness of childhood apraxia of speech on Halloween! This handout explains CAS and states that your child is still learning to say “Trick or Treat”! Make visiting Santa as fun for children with apraxia as it is for all children! This download will tell Santa about your child and has spaces for you to fill in your child’s wish list of presents! Apraxia of Speech – What’s That? This download explains why talking is difficult for children with childhood apraxia of speech. 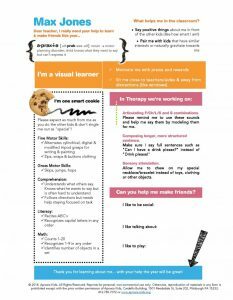 This handout details some of the most important speech features of Apraxia of Speech in Children. Read about basic speech therapy principles that are most often used in effective speech therapy for childhood apraxia of speech. Tri-fold full-color brochure outlining the mission and programs of Apraxia Kids, includes at-a-glance information on everything from our Intensive Training Institute to our online support groups. Everything you need to know about the organization at a glance! You can use these easy-to-carry rack cards to help others understand what the Apraxia Kids organization strives to do, and offer examples of how we serve communities all over the United States and Canada. Includes easy-to-understand bulleted information on our programs and fundraisers. You can use these easy-to-carry rack cards to help parents of classmates and friends understand apraxia. Includes easy-to-understand language about apraxia on the front and an info-graphic on the back. Helping teachers, administrators, and classmates understand a student’s Childhood Apraxia of Speech. This 8-page booklet covers the basics of apraxia, how it may affect students in various ways, and offers many suggestions on how teachers and others can help in the classroom. Full color. Tri-fold full-color brochure explaining childhood apraxia of speech in easy-to-understand language. Includes general information on why some children may find it difficult to speak, when to be concerned about a child’s speech, and tips on helpful approaches for communicating with a child with CAS. You can use these easy-to-carry rack cards to help others understand apraxia. Includes easy-to-understand language about apraxia and an info-graphic.